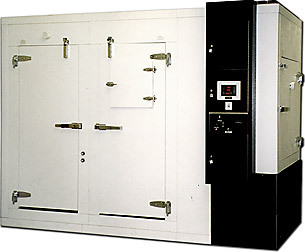 The GC series are available in both reach-in and walk-in models, with capacities from 8 ft2 to 108 ft2. They are available in a various configurations, including benchtop and "double decker" models, to provide maximum versatility in limited spaces. Two shelf models are also available for arabidopsis research. Construction is all woodless, with painted aluminum surfaces and polymer foam insulation. GC series units utilize an upward airflow design with air uniformly distributed through the aluminum channel floor. Most models come with counterweighted light fixtures for easy fingertip adjustment of position and intensity. Depending on model and selected options, lighting levels range from 266 µmoles to 1470 µmoles (at 6" from lamps) with the standard fluorescent/incandescent arrays. We can provide additional lighting options to suit your requirements. 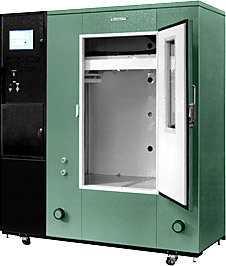 GC series chambers are designed to operate in ambient temperatures up to 35°C. Most models have a standard operating range of 4°C to 45°C ±0.5°C with lights off and 10°C to 45°C ±0.5°C when fully lit. Check with us for specific details and options on individual models. Growing Height 30" 30" / 28" 48" / 56" 59" 48" 58"
Interior Dimensions 42" x 27" 42" x 27" 49" x 24"
42" x 27" 48" x 30" 73" x 31" 73" x 31"
Exterior Dimensions 53" x 30" 72" x 30 72" x 30" 78" x 33" 96" x 36" 106" x 34"
Access Door Size 34" x 24" 34" x 24" 24" x 48" 24" x 59" 2-26" x 48 30" x 54"
Overall Height 59.5" 42" / 81.5" 75" / 65" 78" 77" 79"
Light Height fixed fixed adj./fixed adj. adj. adj. Growing Height 80" 80" 80" 80"
Interior Dimensions 97" x 53" 97" x 89" 108" x 109" 108" x 162"
Exterior Dimensions 136" x 59" 95" x 136" 116" x 131" 116" x 218"
Access Door Size 2-30" x 78" 30" x 78" 34" x 78" 34" x 78"
Overall Height 102" 102" 102" 102"
Light Height adj. adj. adj. adj.